Just another weekend in Texas: it's sunny and in the 80s one day and then barely surpassing the 40s with some sleet the next. The fickle Texas weather didn’t stop the Denton Community Market from kicking off market season with their Grand Opening Weekend. Vendors bundled up and set up shop, ready to brace the wind if not the typical rush of customers. Dentonites still came out to get their fresh produce, replenish their stocks of homemade soaps and candles, and treat themselves to delicious baked goods, as well treats for their pups. The Denton Community Market is a staple of the community, celebrating its ninth year, and continues to grow and thrive with each market season. The market offers a little something for everyone: activities for the kids, fresh produce, and a wide range of offerings from local makers and artists. The Pet District has homemade dog treats, pet beads, and toys for your four-legged friends, and if you’re looking to just grab a bite and take in the scene, you can grab lunch from a food truck and sit back and listen to some local tunes at the gazebo. With beautiful weather in the forecast for this weekend, the Denton Community Market is hosting Opening Day of the Denton Community Market: Part 2, The ReDo this Saturday, April 14. Vendors and board members are looking forward to what is anticipated to be a sunny recreation of Opening Day at the Market. Matthew Sallack, of Otter Illustration and a DCM Board member, was one of the vendors that braved the cold temps. Sallack hopes they are able to respark that “Opening Day Magic” and celebrate the Opening Day one more time, but now with appropriate weather. Kimberly Bein of Salted Sanctuary looks forward to opening day each year. A long-time maker vendor at the market, Salted Sanctuary Soap is celebrating its 7th season at the market, and Bein is a board member for the DCM as well. Out of 100 registered vendors, only about 30 were able to set up and try and make it through as much of the day as possible. DCM vendor coordinator Rachel Weaver spends a significant amount of time organizing and supporting the market vendors, and brings a lot of excitement to each Market Day. That energy will be added to the enthusiasm behind the Opening Day Redo. “Vendors, musicians, and visitors are looking forward to Opening Day Part 2: The ReDo!" Weaver said. "Local farmers are bringing tasty varieties of fresh produce, returning vendors are showcasing their new ideas and old favorites, and new vendors are excited to show the community what they have to offer. We already have over 85 vendors attending the ReDo, and over 100 local vendors for the Market season." Musical talent lined up to perform this Saturday includes David Arvisu, Layne Elizabeth, Lizzi Trumbore, and Richard Gilbert. Vicki Oppenheim is the executive director of the market and president of the DCM board, and despite pouring her heart and soul into the market each week, she shows up bright-eyed and ready for the day every Saturday, even when the temperature is close to freezing. "Last Saturday we had an impressive attendance of visitors and vendors for Opening Day Part 1, despite the freezing temperatures, wind, and misty rain," Oppenheim said. "It was a record cold for Opening Day in our 9th Season. The turnout shows the excitement that the community has for our weekly event. Some vendors sold out. Since many people could not make it out in that weather, we decided to continue the celebration this Saturday as 'Opening Day Part 2: The ReDo.'" 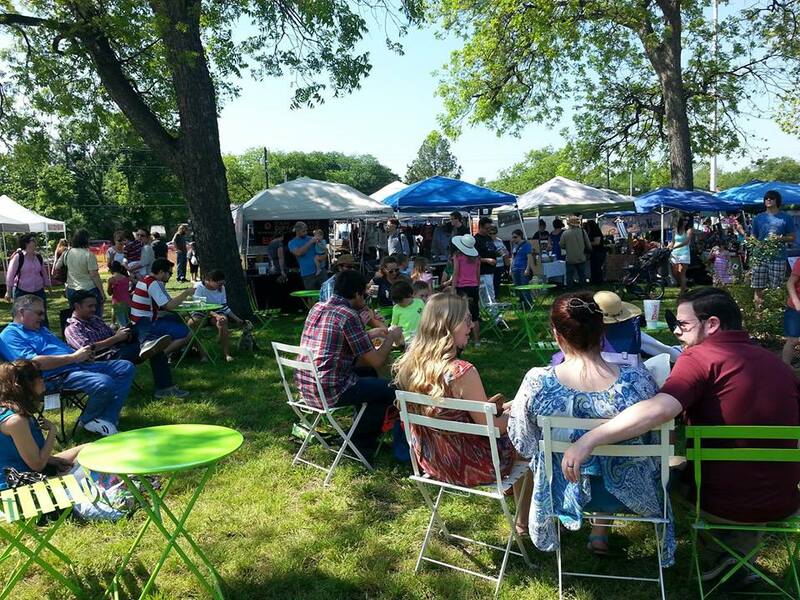 This season will feature several new vendors, special events, and fundraising opportunities to keep the market a thriving part of the Denton community. Keep up with them on social at Facebook, Instagram, and Twitter.